How Does A Drywall Screw Gun Usually Function for Different Projects? Can you imagine driving thousands of nails every day, striking each nail with the hammer until it gets to the desirable depth? Carpenters from all around the globe used this technique for thousands of years, with each drywall project taking more than a week or so to complete. These techniques were tedious and wasted a lot of time. The introduction of a power tool to aid in the process of hammering the nails has happened fairly recently, which is why many may not be familiar with, or may not even have heard about, the drywall screw gun. A drywall screw gun is an excellent tool which can save a lot of time. The precision with which it screws each nail into place is amazing, which is why many professional carpenters prefer the screw gun over the traditional method. What Is a Drywall Screw Gun? A drywall screw gun is a power tool that is similar to a power drill but has the sole purpose of driving nails through the surface of the drywall. It has a ‘nose’ in which the nails can be fitted, and has an adjustable head section which enables the user to manually set the depth that each screw will pass through. With the help of a powerful motor, it can easily screw thousands of nails within a short period with pinpoint depth accuracy. This is why professional carpenters prefer to use the drywall screw gun. How Does the Drywall Screw Gun Work? At first, the correct depth of the head section must be adjusted. This will ensure that the screws are being inserted at the desirable depth. As the head section is adjusted, the user may direct the screw gun’s nose towards the drywall with the screw to the nose and press onto the clutch. As the clutch is pressed, the motor starts to rotate, spinning the screw into the drywall paper. When the screw is placed in the desirable depth, the clutch disengages which stops the motor. Before you use the power tool, you must go through the screw gun’s user manual that comes along with the screw gun. When you’ve purchased a drywall screw gun, you’ll have to adjust the locking sleeve so that the distance between the tip of the locator and the screw head is approximately 1 mm. Drive a test screw onto the drywall to check if the depth is accurate. If it’s not the depth of your choice, you can obtain the proper depth by continually adjusting the locking sleeve. To remove the bit, you must first pull the locator out of the locking sleeve. Hook the next off the bit with one of the holes on the locator and pull. The bit will be removed. To install the bit, insert it as far as it possibly goes through the opening. Then press straight down onto the bit until it is locked in place. After installing the bit, you must install the locator by pushing it firmly back onto the locking sleeve. Use this power tool in a clean and well-lit area. Do not operate the drywall screw gun in an explosion-prone area. Keep the screw gun away from children. Make sure to use a stable electrical connection when operating the screw gun. Avoid any contact with water or moist surface. Do not abuse the cord and check if it’s intact showing no signs of tear. Avoid any earthed body contact with the screw gun. For the cordless drywall screw gun, ensure that the screw gun is charged properly and that there’s no leakage of electrical charge. The drywall screw guns are great choices for people who need to screw their drywalls within a short period. This power tool helps save time and effort, which is why it is one of the best tools that you may find. 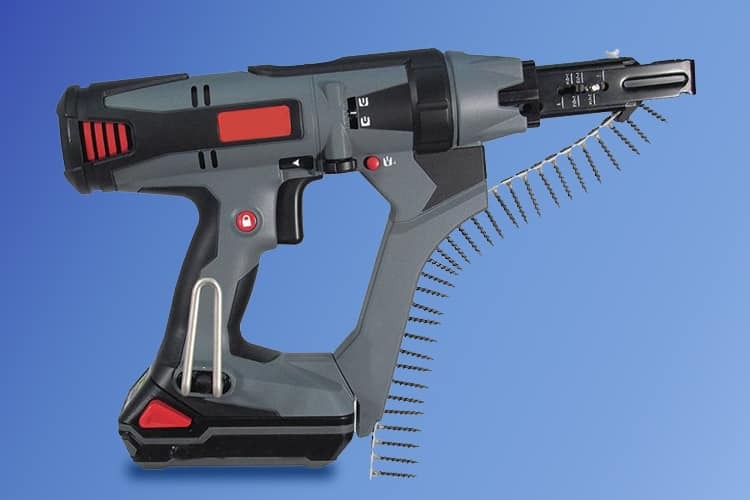 Some people prefer collated screw guns as these have additional functionalities when compared to the regular ones. The best screw gun that you may find is undoubtedly the DeWalt drywall screw gun because of its high comfort, low noise and proper depth adjustment facility. When working with a drywall screw gun, you should always purchase the best quality screw gun that’s available. This will ensure long-lasting performance and comfortable usage experience. If you’re really into carpentry and deciding to begin it anytime soon but can’t decide on which tools to purchase right away, you may consider visiting our website. We list out all of the best products that you may buy to get a head start in building your project.